The vines are so close to the driveway I could pick grapes out the car window. A rooster runs by and I wonder if I’ve made a wrong turn. Then, a short distance ahead, I see other cars parked between a farmhouse and a small rustic wooden barn. 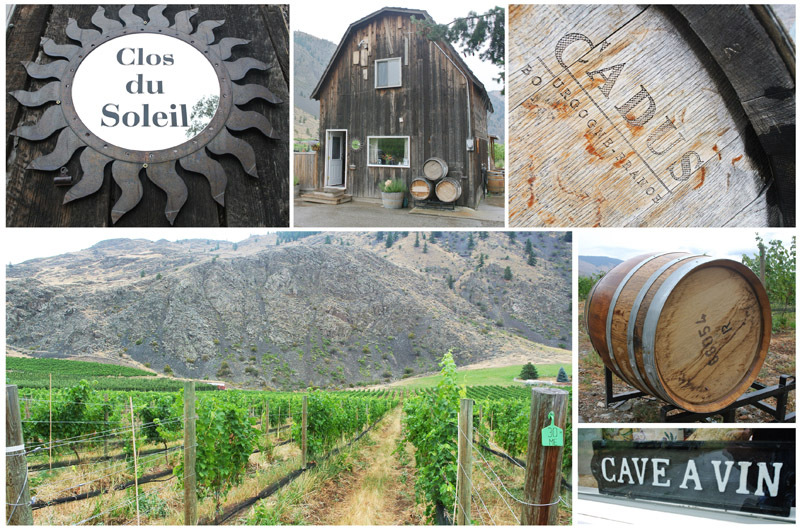 This is the Clos du Soleil winery, one of the Similkameen Valley’s secret treasures. 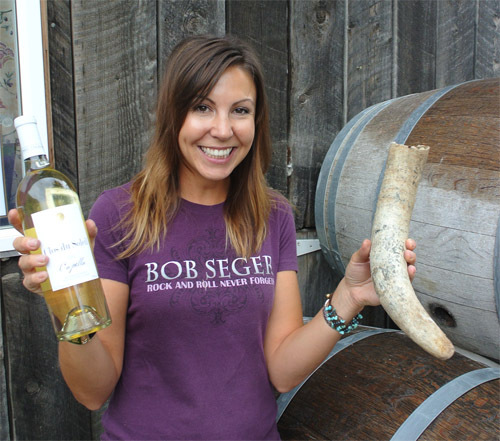 Judging by the Thursday afternoon crowd buzzing around Tasting Room Manager Jesce Walker, its status as an undiscovered brand is already in jeopardy. I’m at Clos du Soleil to find out a few things – like how a french style winery came to be in this remote southern BC valley; why the word ‘organic’ doesn’t appear on their labels or website; and what is their long-term vision for this upstart brand? What ‘Clos du Soleil’ is French for. The winery’s French roots come from owner Spencer Massie’s experiences in Europe. We begin the tasting with a black label Fumé Blanc. My palate is good enough to notice the grapefruit and pineapple tones, but I just nod knowingly when Jesce refers to notes of lemongrass and make a note to steal the term. The wine label colours are a clue to their brand category. Black labels are the approachable everyday drink-right-away wines. Gold labels indicate collaborations with other vineyards and the white label Clos du Soleil wines are the ones you want to stock away in your cellar for a few years. A logical hierarchy, if perhaps a little mysterious to the consumer. Is ‘organic’ a bad word? The tasting moves to a crisp rosé made from Cabernet Sauvignon grapes. This starts off with a classic rosé strawberry patch nose, but has a surprisingly earthy finish. Jesce tells me the Similkameen Valley has volcanic clay ash soil, similar to that in regions of France (and unlike the more glacial sandy soil of the Okanagan) That is what gives these wines more rich minerality. As we move into the reds, I delve deeper into the topic of brand vision. This approach to growing includes tending the vines with the phases of the moon and, in a delightfully pagan-sounding ritual, burying animal horns full of manure to re-energize the soil with its naturally occurring microbes. Another story that bears more fruitful telling. I compare this to the burgeoning craft beer market, and ask if Clos du Soleil plans to compete in the creative name and label trend that has brought so many unique brands to the Okanagan. The wines certainly seem capable of standing on their own, and it helps that the Similkameen was recently named by enRoute Magazine as “one of the world’s 5 best wine regions you’ve never heard of”. But is French-style elegance enough? I can’t help but think there is a more unique, rustic and and authentic brand story here. A story that somehow expands on the term ‘elegance’, to embrace everything from the volcanic rock cliffs to the kittens and roosters that prowl the farmhouse yard. Not to mention the warm, genuine hospitality. And perhaps, properly told, the organically-grown and biodynamic story could open doors in many fine restaurants across the globe, too. Whatever Clos du Soleil decides to do with their brand evolution, As I savour the raspberry reduction overtones of the Grower’s Series Guild Merlot, something tells me they are going to have to build a bigger parking lot. I can certainly endorse the rose and the merlot, and look forward to special occasions to bring out the Celestiale and the late harvest Saturn.